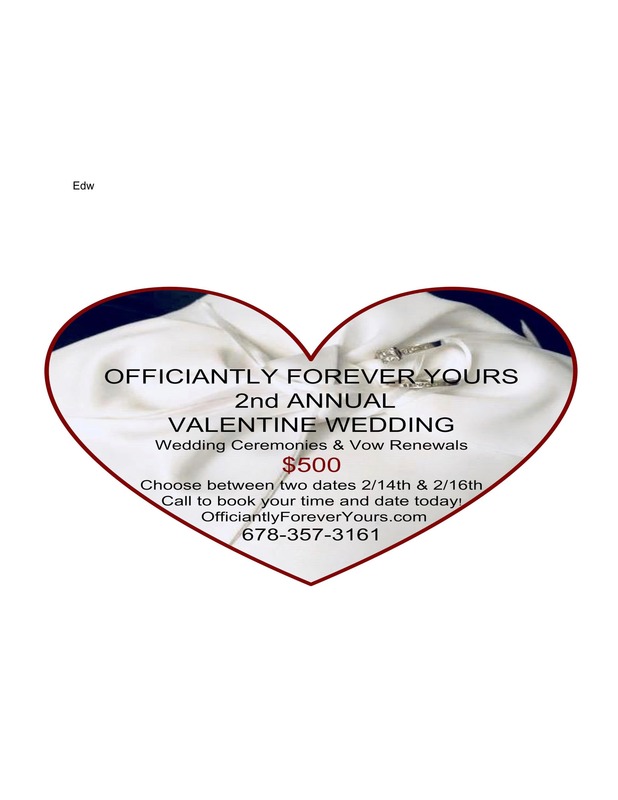 OFFICIANTLY FOREVER YOURS 2nd ANNUAL VALENTINE WEDDING Wedding & Vow Renewal Award winning officiant and military veteran Stephanie Willis provides beautiful and intimate weddings. This event sold out last year so this year she is offering two dates for you to choose from. Times for Thursday, February 14th, 2019 12pm, 1:30pm, 3pm, 4:30pm, 6pm, and 7:30pm. ?Times for Saturday, February 16th, 2019 10am, 11:30am, 1pm, 2:30pm, 4pm, 5:30pm, and 7pm. $500 will save you thousands on a worry free wedding the two of you and your guest will love! WHAT TO EXPECT: Arrive dressed and ready to walk down the isle 15 minutes before your appointed time slot, bring your marriage license* and guest. Then marry the love of your life! WHAT'S INCLUDED: Officiant Stephanie Willis will preform your customized wedding ceremony or vow renewal. Your ceremony will be held in a beautifully decorated ballroom, seating for 30 guests and music provided. Photo package will include 5 photos edited and digitally sent within 7 business days. You choose between a white, pink, or red bouquet and boutonniere (or two of each) to use for the ceremony and photos. Once you have said "I DO!" Stephanie will present you with a decorative keepsake. Then enjoy your 1st dance and cupcakes with your guests. Time slots are on a first come first serve basis, payments are non-refundable. To be respectful of your time and others please arrive 15 minutes before your ceremony start time. Late arrivals will be kept to their one hour time block. * Georgia residents may obtain their marriage license in any county in Georgia before the ceremony. If you are coming from out of state you must obtain your marriage license from Dekalb County Court located at 556 N McDonough St, Decatur, GA 30030.